Compared to their rivals, Puracy has fewer warning labels and more plant power. Their formulas are always safe – just not for the mess! This post is in partnership with Puracy. One of my favorite things to do during this time of year is fall cleaning. I have always found it to be therapeutic. Hardly anything gets me into a better fall cleaning mood than loading my music playlist on Spotify as I purge, clean, and organize! I put away my summer clothes, switch out the sheets for warm flannel sheets, clean out the closets, and prepare the home for the cooler seasons. 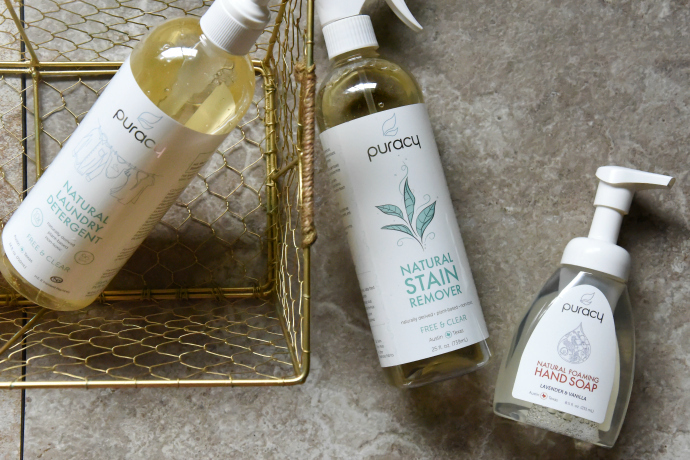 I also give my house a good thorough cleaning with natural cleaning brands like Puracy. 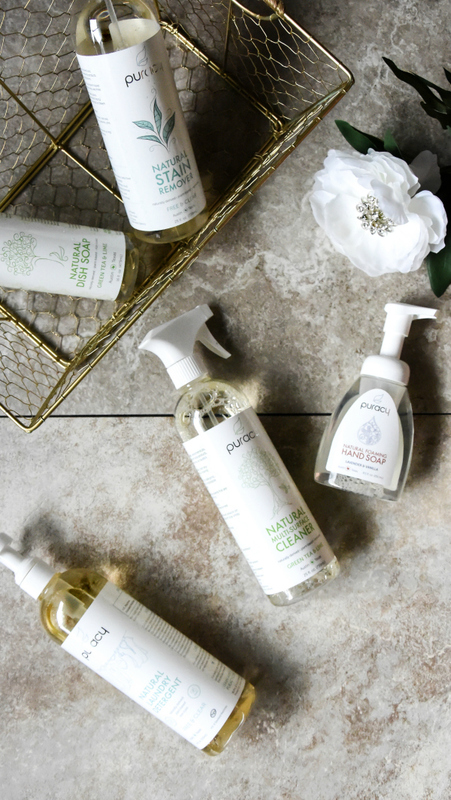 Their products can outperform conventional cleaners and even rival brands like The Honest Company, Green Works, and Seventh Generation. Surprisingly, some of these “all-natural” brands have dyes, synthetic fragrances, sulfates, ethoxylates, and petrochemical solvents that have been known to wreak havoc on one’s health. Compared to their rivals, Puracy has fewer warning labels and more plant power. Their formulas are always safe – just not for the mess! Their Puracy Home Care Cleaning Set is the perfect way to familiarize yourself with their natural household cleaners. 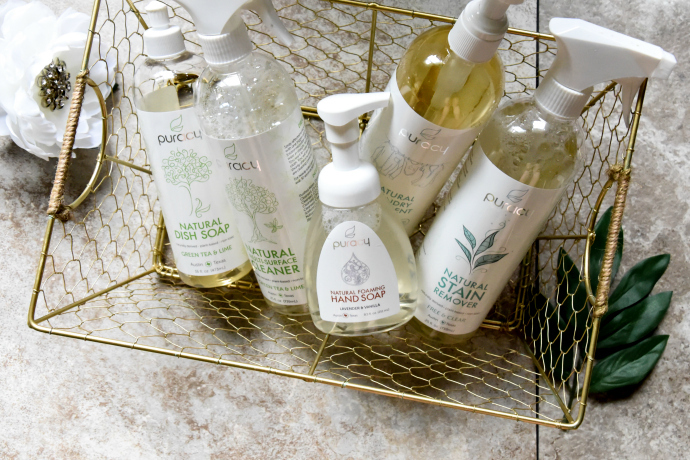 This cleaning set includes their Natural Dish Soap, Natural Laundry Detergent, Natural Multi-Surface Cleaner, Natural Liquid Hand Soap, and Natural Stain Remover. I have tried many “organic” and/or “natural” products that weren’t what they were touted out to be. Proving to be more than pretty packaging, their products are truly made with natural, high-quality ingredients. Some of my top favorites are the Natural Laundry Detergent and Natural Stain Remover. I have sensitive skin and have to be über selective about what I use on my clothing. Otherwise, my skin goes haywire! Their Natural Laundry Detergent is perfect for sensitive skin and allergy sufferers. In addition, this laundry detergent beautifully tackles stubborn stains, dirt, and food without the use of harmful ingredients. It sets itself apart from other laundry detergents since water isn’t the first ingredient. Quadruple plant-based enzyme formula safely removes stains and odors, leaving clothes naturally soft and fresh. Zinc Ricinoleate adds an extra element of odor elimination. It features a pump top to help eliminate measuring and spilling. As if it doesn’t get better, there are 96 loads per a 24-ounce bottle! Their Natural Stain Remover gets rid of dirt and tough stains without lessening the quality of my clothing, ensuring that my whites are pristine white while keeping other colors vibrant and beautiful. It even helps the peskiest stains pull a Houdini! Proprietary blend of plant-based cleansers safely removes grass, berries, blood, sweat, oil, tomato sauce, cosmetics, pet accidents, dirt, and hundreds of other stains and odors. This color-safe formula works great on clothing, linens, carpets, floor mats, car seats, cloth diapers, and other washable fabrics. 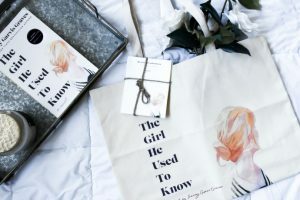 Treating my fall wardrobe with TLC with quality products like their Natural Laundry Detergent and Natural Stain Remover helps my fall wardrobe look its best! When we treat our clothing with the TLC that they deserve can also extend the longevity of your wardrobe. 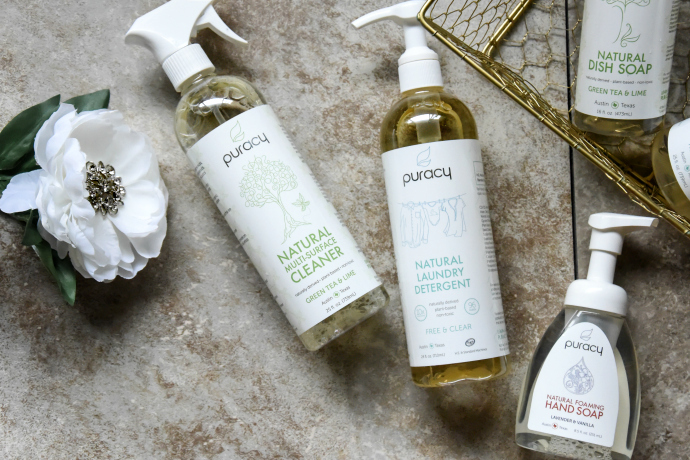 For every sale, Puracy donates natural and organic products to families and children that are less fortunate.